This durable, high quality sight is engineered to give you the advantage of a red dot sight in a compact light-weight, waterproof and shockproof design, whether you use it for rapid fire shooting of moving targets, or normal shooting. 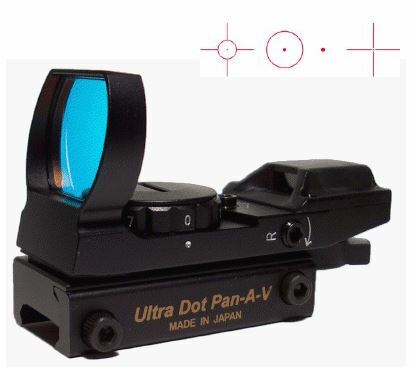 The multi-reticle (4 patterned) optical glass lens is parallax corrected, and produces a clear, high resolution image. This 33mm in diameter lens allows unlimited eye relief, and a wide field of view. The Pan-A-V is one of the smallest, lightest, most versatile sights of it's kind. The Ultra Dot Pan-A-V, like all Ultra Dots, is backed by Ultra Dot's Lifetime Warranty.